In 1853, William G. Allen, the "Coloured Professor" of Classics at New York Central College, became engaged to Mary King, a student at the coeducational, racially integrated school and daughter of a local white abolitionist minister. Rumors of their betrothal incited a mob of several hundred men armed with "tar, feathers, poles, and an empty barrel spiked with shingle nails." Allen and King narrowly escaped with their lives, married in New York City, and then fled as fugitives to England and Ireland. Their love story and brave resistance were recorded in engrossing detail by Allen in two pamphlets-The American Prejudice Against Color: An Authentic Narrative, Showing How Easily the Nation Got into An Uproar (1853) and A Short Personal Narrative (1860). 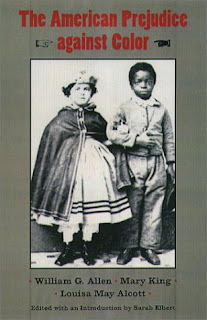 Reproduced here in their entirety, Allen's forthright, eloquent, and ironic accounts, which include excerpts from abolitionist and anti-abolitionist newspaper reports about the incident, drew renewed threats against the exiled pair as well as support from the couple's circle of anti-slavery friends and allies, a diverse group including Harriet Beecher Stowe, Beriah Green, Gerrit Smith, Reverend Samuel J. May, and George Thompson. The experiences related by Allen vividly illustrate the rampant fears of "amalgamation" that sparked violent protests in antebellum America. He also reveals white abolitionists' contradictions regarding mixed-race relationships. Also contained in this volume is Louisa May Alcott's M.L., a fictional tale of interracial love based on her familiarity with the Allen-King episode through her abolitionist uncle, the Reverend Samuel J. May. Alcott's story was refused by The Atlantic magazine because, she said, it "might offend the dear South." An insightful introduction by editor Sarah Elbert places the writings within a historical and cultural context. She details William G. Allen's notable career as a graduate of the Oneida Institute and as an active abolitionist in the network reaching from New York's North Star Country through Boston, Canada, England, and Ireland. In exile, William and Mary King Allen, important members of the trans-Atlantic movement, continued their struggle for "free association" and supported their family by teaching poor children in London.